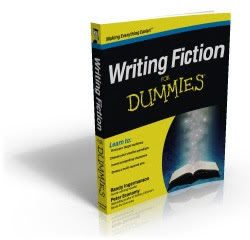 I'm re-reading Writing Fiction for Dummies by Randy Ingermanson and Peter Economy. While I think I have a pretty good handle on fiction when I'm editing and reading the fiction written by others, all bets are off when it comes to my own fiction. I think the title itself speaks to me. But even if you are not a dummy, there are gems in this book for you. With five parts, nineteen chapters and 345 pages if you can't figure out your own writing, then you're just not paying attention! Right now I'm working through the questions (again) where I think about what I love to write. You're told to take a sheet of paper (I did, it's called MS Word...) and answer six questions. I'm considering doing this on my Pinterest page--make it more visual. This exercise is on page 40 if you have the book. I always thought I should be writing what I most liked to read. These guys say this isn't necessarily true. It took a load off my shoulders. I've been trying really hard and nothing has worked for me. I've felt depressed about it in the last six months. I've been on writing teams and been rejected. I've struggled with manuscripts and themes, and nothing ever lined up. I've watched many people I've helped to get published seemingly breeze through this thing, while I still sit in the starting blocks. I know what I love to read. Now, to find what I love to write. Another part that is just penetrating my skull is to "stay out of the editing mode." You think, "Well, duh, Crystal!" I have never really given myself permission to write. I have written tons of scenes and given myself permission to do that, but never the entire story. Short stories seem to work fine for me. I have yet to find my "sweet spot" with longer fiction. Then, on page 68 is a table showing the various Creative Paradigms. I always thought that I was a "seat-of-the-pants" writer. I'm pretty sure I'm not when it comes to fiction. For nonfiction I can jet off in a speed boat when it comes time to write. Not so with fiction. It drives me crazy not to know the big picture first. I need an outline. I can change around scenes if I want, but I have to have that road map and a view from above in the plane--not open water and no clue at what is coming around the bend. With this kind of insight at this stage of my life and writing, I am hoping that I finally will find my place in the writing world. I highly recommend this book--even if you think you're far down the fiction road, or have already read it. See yourself with new eyes through the mindset of this book. I always have books to read. It's both a blessing and a curse. 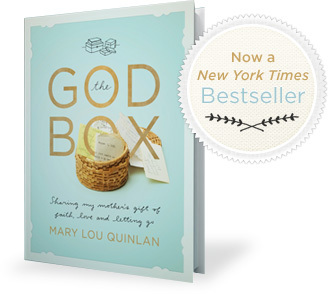 Right now I have a book called The God Box by Mary Lou Quinlan on my desk, which is a New York Times Bestseller. You can see more at http://www.theGodBoxproject.com . You can even download a sample to read first. What attracted to me to this book is the nostalgia--and that Mary Lou's mother had left behind these treasures. This happened to me, too. My mother left behind letters, newspaper clippings, verses in her Bible, also saving things I'd made for her that makes me feel as if the conversation is still going on with her. My mom, also, was good at forgiveness and "letting go" of past hurts and was able to allow God to work. 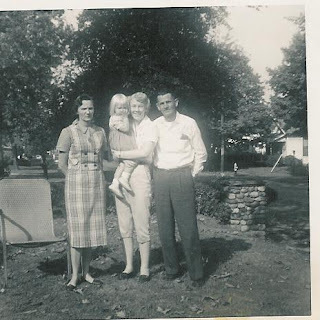 My mother had TB when I was just about a year old and had to let someone else take care of me while she got better. Now that I'm a mother, I can understand just how hard that was--especially since she had miscarried so many babies and then finally got me. I wish I had the letters that she wrote to my Grandmother during that time, but I doubt that anyone thought to keep them for me. It would have been a wonderful legacy. Mom getting me back after she came out of the TB hospital. I had "grown up" and she missed so many things in my childhood. Anyway, I'm looking forward to getting time to read this book. Have you read it? Any thoughts to share about it and the idea of leaving behind your prayers in a book or box? P.S. Did you notice the new header? This is fun--the two boys are sons of my son's teacher from elementary school. My friend, Mary Lynn, who makes my headers, keeping them fresh, does lovely work with photos. 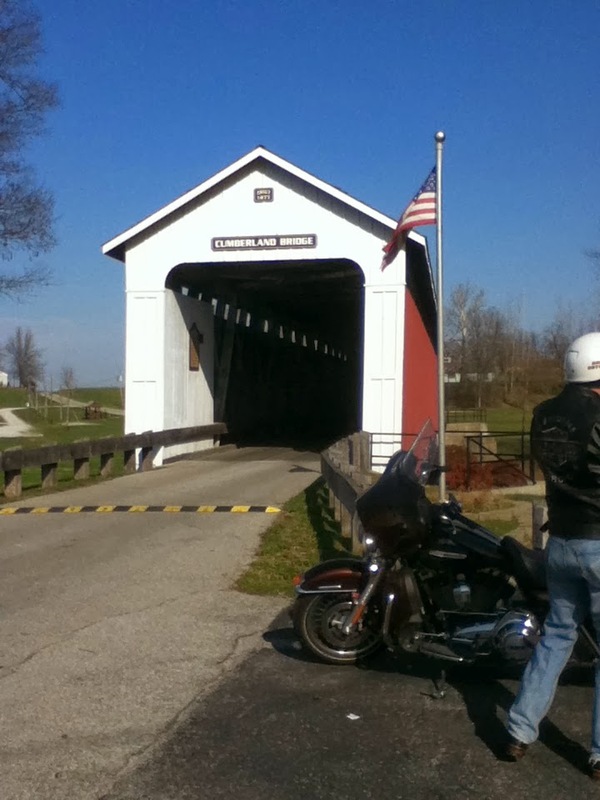 Check out her website where she shares many of her creations there with readers/friends. Thanks, Mrs. Sarah Southworth! And thank you, always, Mary Lynn.